The alarm went off at 3:30 AM. It had been a while since I had woken up that early for fishing. With our coffee in hand and Bearcat in tow, we headed north under clear skies. We have had an unusually warm spell for January and after a few days of sustained melting temperatures and sunlight a front was moving in. Our theory was that the fish would sense the incoming system and be putting on the feed. We arrived at the lake with more than enough time to load up the sled and head out to our predetermined area before the crack of dawn.... WAY MORE than enough time. 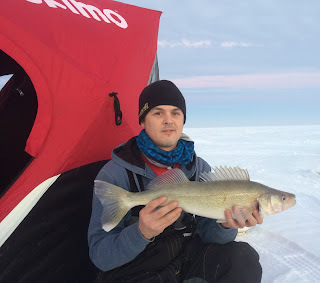 One bite was missed fishing outside in the darkness and we figured with confidence in our chosen spot and plenty of time before sunrise we should set up the shack and hunker down for the morning bite. As the sun rose, the clouds moved in from the south. 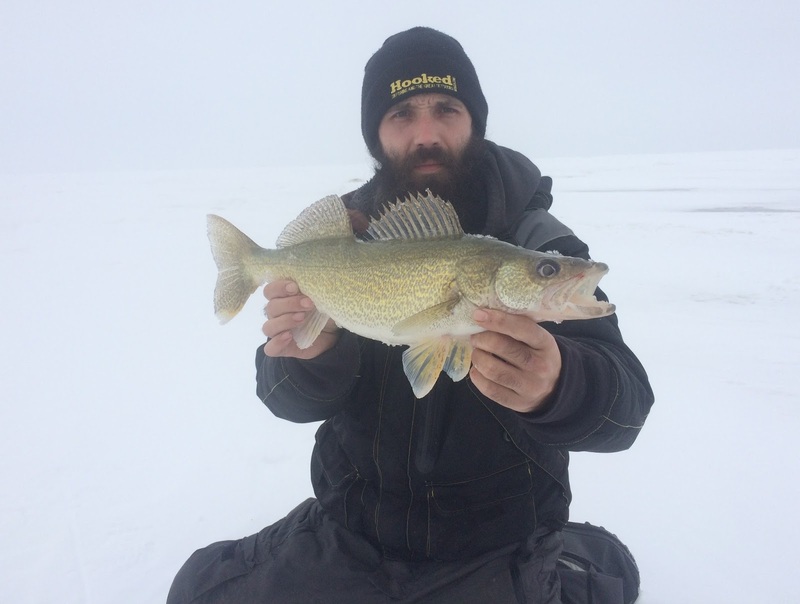 The fish moving through weren't as aggressive as we had hoped, but after downsizing Jay was able to bring a reputable walleye above the ice. With the nice weather still around us and a slow bite beneath, we decided to prospect out deeper. After a few kilometers of sled travel and 3 spots tried all we could find was less optimum water clarity and non aggressive fish. 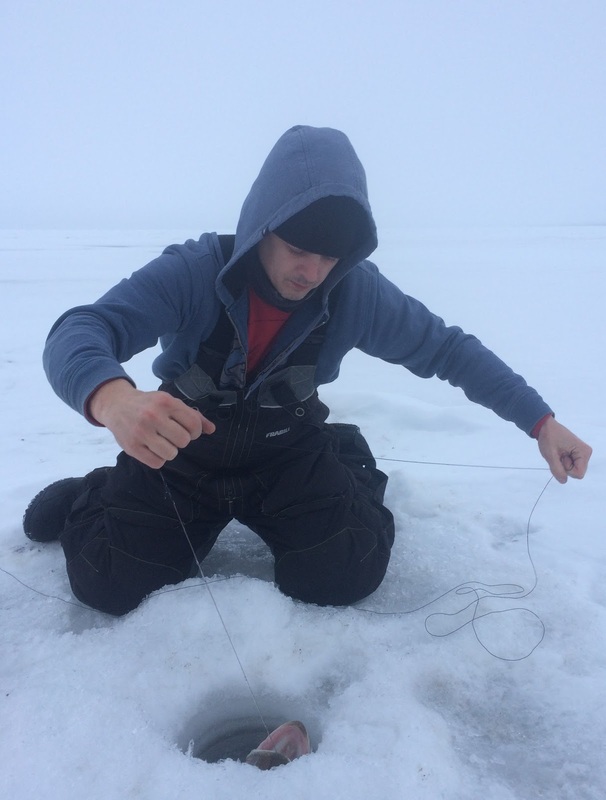 Knowing our initial spot had produced some nice fish over the lunch hour on previous trips, we decided to try near a pressure ridge for a few minutes and if it didn't produce we would go back to our starting spot with more than enough time before lunch. Water clarity was good where we drilled and we both missed a bite within five minutes of dropping a lure. We decided to set up the shack and put out one tip up each within 20 feet of our doors. On previous trips we had been impressed with the pike action while jigging and this would be our first try with tip ups on this lake. It was around 11 AM when the first flag went and over the next five hours we were more than entertained from the action. We were able to jig up a few more eyes and pike on the rod, even a 20 inch white sucker slammed my spoon. Truthfully though it was the pike action that took the prize. The visual aspect of watching for a flag and seeing the line peel off the reel. The primitive hand over hand of retrieving the line once the hook is set. It's you against the fish and one of my favorite methods of fishing. While January might not necessarily be prime tip up time, the bite was on. 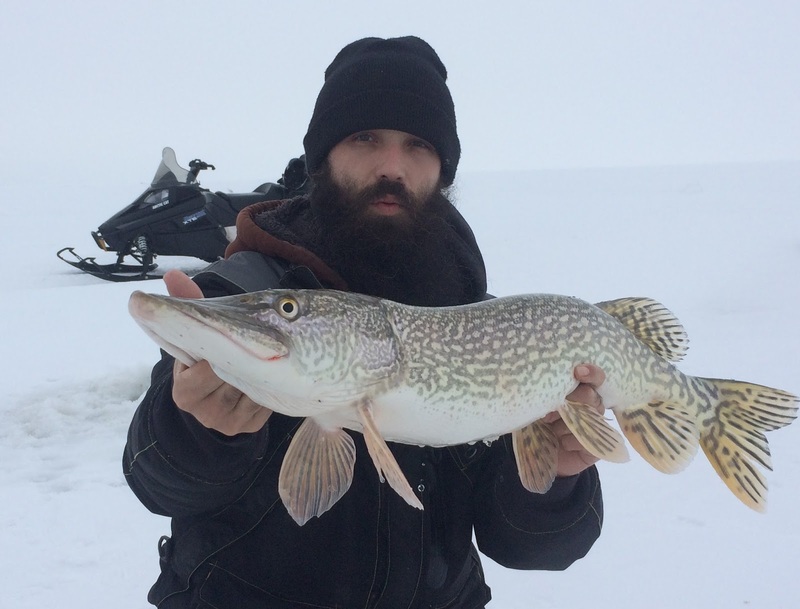 The biggest pike topped out a half inch under three feet in length and like all but the few we retained, released with vigor to the cold water below. We had agreed to stay until dark and we might not have been the last folks off the lake but I am sure we were some of the most satisfied. Our drive home was wet and foggy as the further south we went the more rain we came across. It's not the kind of weather that comes to mind for Manitoba in January but the cold weather is on its way back. 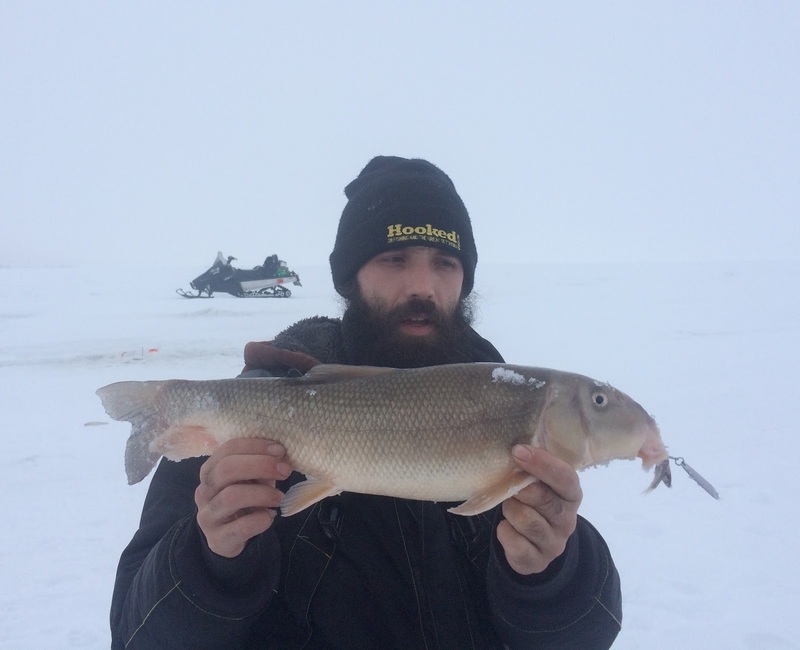 The first of what I hope will be many more flags this ice fishing season are behind us and I couldn't have asked for a better day!